Sutton on Sea's In Bloom judging day was held last week. The task to make Sutton on Sea look blooming beautiful all came to a head last week as the In Bloom judging day came upon the town. Mayor of Sutton on Sea and Mablethorpe, Coun Joyce Taylor welcomed the two In Bloom judges Mel Henley and Diane Moore last Thursday. She also praised the efforts of all the hard work the volunteers has undergone prior to judging day. The chair of Sutton on Sea Gardening Group, Kath Riggall then highlighted some new editions to this year’s route which included the new ‘toilette garden’ and new planters by the village signs and near the promenade. They also held as part of In Bloom an Easter bonnett competition for local school’s in the area and a competition to see who had the best local garden. The winner of that was Jon Nicklin and Christine Frost of Marine Avenue. Ms Riggall also praised local businesses for their support and a number of donations that were given to the group. 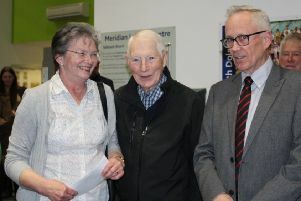 Judge Mel Henley praised the town and said: “I have never been to Sutton, but I will be definitely be coming back. Secondary judge, Diane Moore said: “It was a real pleasure to walk around the route and everything looked really stunning.